Janakpur, also known as Janakpurdham, is one of the historical and religious cities of Nepal. Janakpur is the administrative headquarters of Dhanusa District of the Janakpur Zone and has a population of approximately 80,000. The city is located about 123 km south-east of Kathmandu, 20 km from the Indian border at 26° 42' 44" N, 085° 55' 18" E Janakpur has a substantial tourism industry due to its significance in the Hindu religionand is home to the only operational railway in Nepal, the Janakpur Railway. Janakpur, historically called Mithilanchal, is the centre of the ancient Maithil culture, which has its own language and script. The first millennium BC text Shatapatha Brahmana tells that the king Māthava Videgha, led by his priest Gotama Rahugana, first crossed the Sadānirā (Gandaka) river and founded the kingdom of Videha, whose capital city was Mithila. As Gotama Rahugana composed many hymns in the Rgveda, these events must date to theRgvedic period. The most important historical reference to Mithila/Janakpur is in the Hindu epic Ramayana, where Lord Rama's wife Sita Devi (also called Janaki) is said to have been the princess of Videha. Her father, King Janak, found baby Sita in a furrow of a field and raised her as his daughter. When she grew up, the king announced that she should be wed by whoever was able to string the divine bow of Shiva. Though many royal suitors tried, Lord Rama, prince of Ayodhya, alone could even lift the bow. As Rama and Sita are major figures in Hinduism, Janakpur is an important pilgrimage site for Hindus. In addition, both the great saints Gautama Buddha, founder of Buddhism, and Vardamana Mahavira, the 24th and final Tirthankara of the Jainreligion, are said to have lived in Mithila/Janakpur. The region was an important centre of Indian history during the first millennium. Janakpur is located in the Terai, alluvial, forested and marshy terrain at the base of the Himalaya mountain range. The major rivers surrounding Janakpur are Dudhmati, Jalad, Rato, Balan and Kamala. Janakpur is famous for its temples and the numerous ponds which carry significant religious importance. One can see all the six seasons in Janakpur. Basant ritu (Spring-February/March), Grisma ritu (Summer- April/May/June), Barsha ritu (Rainy - July/August), Sharad ritu (Autumn- September/October), Hemanta ritu (Autumn-winter: November/December), Shishir ritu (Winter: December/January). The best time to visit Janakpur is from September to March as the weather is pleasant and several festivals fall during this period. Janakpur is one of the fast developing cities of Nepal and is on the way to meet the criteria for being the seventh Sub-Metropolitan city of Nepal. The city has good health care facilities, as well as good private schools and colleges and Internet service providers. The economy is mostly based on agriculture. Janakpur attracts migrants from the surrounding area, who move to the city for medical care, education and jobs. The largest employer is the Janakpur Cigarette Factory Limited. There are also two poles factory and one hume pipe factory like Shri Janaki Poles Industries,Shri Janaki Hume Pipe Industries,Nepal poles Industries. Janakpur has an airport.The airport is served by a few private airlines, with daily flights to and from Kathmandu.The duration of flight is about 20-25 minutes.The aircrafts are usually small with 17-20 passenger capacity. Airports in nearby India have domestic flights to major Indian cities. It is on the Janakpur railway, which goes to Jaynagar station in India. The track is in poor condition though. It is near to Sitamarhi railway station which is just 45kms and Jaynagar railway station which is just 32kms, both in nearby India. Both stations are connected to important cities like New Delhi, Kolkata, Mumbai. It is possible to drive to the city from India. The centre of Janakpur is dominated by the impressive Janaki Mandir to the north and west of the bazaar. This temple, one of the biggest in Nepal, was built in 1898 (1955 in the Nepali calendar) by Queen Brisabhanu Kunwar of Tikamgarh. It is also called "Nau Lakha Mandir" after the cost of construction, said to be nine (nau) lakh. The oldest temple in Janakpur is Ram Mandir, built by the Gurkhalisoldier Amar Singh Thapa. Pilgrims also visit the more than 200 sacred ponds in the city for ritual baths. The two most important, Dhanush Sagar and Ganga Sagar, are located close to the city centre. The Vivah Mandap temple where Lord Rama and Sita are said to have been married. It is situated next to the Janki Mandir. Major religious celebrations include the major Hindu festivals such as Deepawali, and Vijayadashami. followed by spectacular Chhath Puja (sun worship) six days after Deepawali. Both the festivals Deepawali and Chhath are heavily celebrated with a carnival-like atmosphere. The locals take pride in the way these festivals are celebrated. On the full moon day of February/March before the festival of Holi, a one-day Parikrama (circumambulation) of the city is celebrated. Many people offer prostrated obeisances along the entire eight km route. 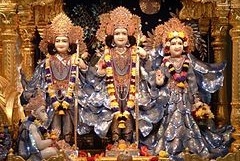 Two other festivals honor Rama and Sita: Rama Navami, the birthday of Lord Rama, in March–April, draws thousands of pilgrims. And the Vivaha Panchami or Vivaha festival re-enacts the wedding of Rama and Sita at the famous Vivah Mandap temple on the fifth day of the waxing moon in November or early December(after Kartik Purnima),where Rama broke the bow of Shiva. Janakpur has the Janaki Temple (Mandir in Nepali) which is dedicated to Goddess Sita, and also has a Ram and Sita Marriage Mandhir (or also known as Ram and Sita Bibaha Mandhir in Nepali) which is said to have been built in the spot where they got married. Marriage anniversary of Ram and Sita is observed every year here through a festival which is also observed throughout Nepal. In the Janakpur region, one of such festival is the enactment of the wedding ceremony, decorating temples and monuments, burning of oil-lamps surrounding the temple and other historical sites in the region. Throughout the festival there are dramas in theaters and in open streets re-making the marriage ceremony of Ram and Sita. According to Hindu, Ram and Sita took birth to free the earth from the cruelty and sins of the demon King Ravana (Ravan). To learn more about the Hindu Goddess, see web link at the end of this page. Visit the Rama Mandhir, a pagoda-style temple built in 1882, which is located south-east of the Janaki Mandhir. On the Rama Nawami or also written as Ram Navami festival (the celebration of Lord Ram's Birthday), this temple gets thousands of visitors. Ram Nawami is also called as Chaitay Dashain, and it falls on Chaitra 13 2063 (Nepali Calendar) or April 27 2007 (English Calendar). Mithila culture is found in the Terai region of Nepal such as the Janakpur region and also found all the way upto the Northern Bihar state of India. Legend has it that Janakpur was the capital of Mithila, and the palace of King Janak, Goddess Sita's father. Often Sita is known by many names such as Janaki or Mythili. Mithila culture is rich with its own language known as Maithili, and with its own traditions, customs, arts and music. Many Mithila arts and paintings have historical and religious meanings, such arts are produced by many villagers specifically women's draw paintings having colorful and thought provoking objects such as animals, Gods and Goddess which are painted on the walls of homes using simple colors such as clays and mud. Dhansua Dham is a historical and religious site its reference dating back to the great Hindu epic Ramayana.It is believed to be the place where fell broken remains of the divine shiva bow that Ram broke to obtain Sita’s hand for marriage.A fossilized fragment of the broken piece is still believed to be seen and is worshipped by devotees.Dhanushadham is in Dhanusha district and Janakpur zone.Janakpur is approximately 390 kilometers and 10 hour drive from Kathmandu.Buses to district headquarters Janakpur city leave from Central Bus Station, Gongabu in Kathmandu.One can also take a 40-minute flight to Janakpur city from Kathmandu.Dhanushadham which is 18 kilometers is an hour drive from Janakpur.Public transportation is available to Dhanushadham from the city area.The best months to visit Dhanushadham is between October-March.The weather is hot, humid during summers and pleasant during winters, with maximum rain between June-August. previously known as Janak Sarobar holds historical as well as cultural significance.It is believed to be the pond where Rishi Parashuram bathed to quell his anger after his confrontation with Ram over breaking of the sacred bow.The lake is also picturesque with lotus flowers growing on it and lush trees on its southern banks.The lake in Mithileshwor Nikas VDC is 4 kilometers west from Dhanushadham.It falls on the way to Dhanushadham from Janakpurdham. Near Dhanusha Temple is ideal for picnic or leisurely walk in the shade.The forest is lush with trees, bushes and a big pond.There are possibilities of carrying out sports in the lake in future.The forest is near by Dhanusha Temple. Maithili women are known for their traditional art, especially their paintings on pottery, walls and courtyards. These Mithila Paintings are famous internationally. Janakpur has five movie theaters. They show new and old movies in Maithili, Bhojpuri, Nepali and Hindi. Hollywood movies are less popular among the locals. Apart from this, several stage shows, concerts and plays are occasionally organized by the local clubs and organizations. Prominent among these is Mithila Natyakala Parishad(MINAP), which is a not-for-profit organization, claiming to be dedicated towards promoting Mithila culture. Janakpur has several hotels including Hotel Manaki, Hotel Rama, Sita Palace, Hotel Welcome. There are also several cheaper lodges and Dharmsala(cheap accommodations) for pilgrims. We are travels operating firm in Gorakhpur, Uttar Pradesh established since 1980 by the two brothers Mr. Anil and Sunil Kesherwani. We have started our business with 1 Bus with our good and timeliness service we have created a good reputation in mind of people and became a biggest Bus fleet owner in the city. We are best and oldest travel agent in Gorakhpur,Travel agent in Gorakhpur for Janakpur Tour,Tour operator in Gorakhpur for Janakpur Tour,Bus hire for Janakpur Tour in Gorakhpur,Tour Package for Janakpur Tour in Gorakhpur,Travel agent for Janakpur Tour in Gorakhpur,Buses for Janakpur Tour,Bus Booking Service in Janakpur Tour.